Talking to Bloomberg TV, he said that UK monetary policy had made “life difficult for ordinary savers”. The policies were brought in after the banking crisis of 2008 and the subsequent recession. He said the policies had been “very necessary” to keep the economy strong, but their impact had to be mitigated. It is not a novel observation that the UK’s monetary policy has largely benefitted the wealthy, via higher share prices and higher house prices, and disadvantaged savers who are now earning hardly anything at all on their savings. 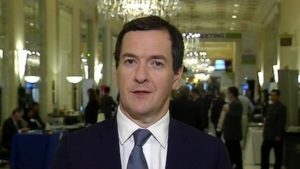 But while he was chancellor, until his recent sacking by new Prime Minister Theresa May, Mr Osborne’s emphasis was always on the necessity of staving off recession and keeping the economy growing. What monetary policies is he talking about? He doesn’t explicitly say. So here’s a list of three policies from his time as Chancellor of the Exchequer. Not necessarily Osborne’s monetary policy to blame here, as it’s the Bank of England that sets the rates. However they have an inflation target, and while inflation is close to zero there is little rationale for interest rates to be much more than zero either. Except that there is a good deal of collateral damage. For a start the whole pensions industry is exposed to interest rates, in particular their financial health is assessed by valuing liabilities (future payments to pensioners) as if cash were put aside today gathering interest through investing into government bonds until each payment. The lower the interest rate, the more the pension fund must have invested. It’s easy to say that pension funds are the problem of employers. And employers do frequently make special payments into pension funds for this reason. But as we saw with BHS, sometimes there’s no money left. It’s not just pension funds. Pensioners buying annuities – turning a pension saving into a regular payment till death – have found these getting more and more expensive. When long term interest rates were at around the 8% level, annuity ratios (the ratio between the amount paid in to the annuity and its annual payment back again) was around 15. These days it’s more like 25, depending on how inflation-proof the payments are. In short, pensions have fallen by something like 35%. Savers also suffer low returns when rates are low. Borrowers should rejoice, however, because borrowing rates have also fallen. But not to the near-zero rates savers are seeing. Interest rates have reached zero. Effectively. In some countries they are lower than that – you have to pay to lend money to your government. Which might lead us to wonder why we don’t just keep cash under the mattress. Well, it’s an option. So what the central bankers have done instead is to create more money. It’s computed as a debt but it is never likely to be repaid. The central banks (the Bank of England in the UK) basically lend money to the government that they have created from nothing. The government uses that to buy assets from banks, usually commercial debt, so that the cash starts flowing through the financial markets. Why? To provide liquidity. So that banks can lend it to you and I. But what actually happened wasn’t the “trickle-down effect” intended, but a rise in asset prices. Positive Money calculated that in the UK £375 billion of QE increased GDP by only £23-28 billion. The beneficiaries were property investors and financial market investors. The new money created by QE, coupled with lowering interest rates and a history, certainly pre-2008, of ever increasing mortgage lending meant that money was flowing into the property market faster than ever. House prices rose fast, effectively cutting a whole layer of savers out of the housing market. And to add insult to injury, rents also rose, especially in London, where UK house price inflation was highest. The government’s response? Help-to-buy. Now, If Economics 101 taught us anything it’s that when demand rises faster than supply, prices rise. What Help-to-Buy did was to provide taxpayers’ money to young savers provided they used it to buy a new-build house. Yes, it helped a small number of savers, but the real winners were the house builders who are enjoying some additional demand with their products. George Osborne is right about his monetary policy. And I’m pleased he said this, although six years ago would have been better. I have written many times about how wealth inequality is today’s biggest threat to our democratic society. It’s generally considered to be a consequence of neoliberalism, which doesn’t see it as a problem so long as the poor get richer too. But has that been happening? New pensioners would disagree as would young people caught in the rent trap, with no hope of saving enough for their own home. George Osborne is right when he says “All of us who believe in free markets, in our democratic institutions, need to work harder to find an answer to the anger people clearly feel out there.” The answer is to stop Quantitative Easing, rein in banks who inflate the economy with their free-spending mortgage lending, scrap schemes like Help to Buy and to tax wealth in the form of a Land Value Tax so that those who build up property assets effectively pay their fair share of running the country.